"What we have to work on in the twenty-first century is to overcome the division between people and the environment, so the future of humans won't be different from the future of nature." Our journey began in Korea. Hundreds of years ago, Seoul, the capital of modern South Korea, was a newly founded village along the banks of a picturesque creek called Chonggyecheon (37°35′N). As the city grew, the creek became a sewer and finally was covered over by concrete and a freeway. Several years ago, Mayor Lee Myung-bak decided to bring the creek back to the daylight. Now, a seminatural river parkway serves the urban residents of the city. We walked there from our lodge, a traditional inn with bamboo walls, sliding doorways, and an Ethernet-connected computer in every room; modern Seoul is one of the world's most wired nations. Walkways line both banks of the flowing creek, which is punctuated by cascades and stepping-stone bridges. Chonggyecheon impressed us as an urban park, though water from the Han River must be pumped in at considerable energy costs to enhance the flow. The park is used day and night and clearly appreciated by local residents, from children splashing in the creek to romantic couples strolling hand in hand and elderly dog walkers. The mayor moved on to become the nation's president, and his new campaign, to redesign South Korea's four largest rivers-the Han, Nakdong, Geum, and Yeongsan-was a much more controversial objective. In 2009, gigantic excavators began carving riverside bluffs away to double the width of the channels while digging them 12 to 18 feet deeper. The $20 billion national project encompassed the construction of sixteen new dams on the main channels of the four rivers, plus five more on their tributaries, the enlargement of eighty-seven existing small dams, and the addition of concrete lining along 200 miles of riverbank. President Lee called the effort part of a "Green New Deal" intended to store water against the prospect of drought, prevent flooding, improve water quality, restore river ecosystems, promote river-related recreation, and (perhaps above all) to stimulate the economy by creating 190,000 construction jobs and spending a sum equal to almost 20 percent of the nation's gross domestic product. The goals of the Four Rivers Restoration Project sounded commendable, but when viewed closely, the list of benefits seemed exaggerated. We learned the details from and toured part of the construction site with the "Korean Federation for Environmental Movement" (KFEM). Their national headquarters is a comfortable old residence converted to offices, with commuter bicycles lining the walls. There we met with Choony Kim, the organization's chief of international affairs. As Choony explained, South Korea, though densely populated, has plenty of water. Episodes of flooding occur primarily on upper tributaries rather than in the main river channels, where the work was focused. And the engineering approach will likely degrade, rather than improve, water quality, because slower water movement increases accumulations of algae and pollutants. Most important, the removal of natural wetlands and streamside vegetation clearly does not achieve "river ecosystem restoration," but rather destroys habitat. Natural beauty and wetlands critical to migratory birds and other wildlife were being replaced with bike paths, spraying fountains, and many miles of city-style parks. When we pointed out that dams and channelization are old ideas about how to manage rivers, Choony said, "Many experts agree." She had worked for KFEM since 1995, after studying at the Yale School of Forestry and Environmental Studies in the United States. She speaks excellent English and was eager to talk to international visitors about the project, to counter publicity the government was providing to media outside Korea. Choony showed us dramatic before-and-after photographs taken at construction sites. As rivers are widened, villages and farms must be relocated. Her frustration showed as she explained that some of the displaced rice farmers, following years of encouragement by the government and environmental groups, had transitioned to organic farming, controlling insect pests in the paddies with ducks instead of pesticides and using weed-eating snails in place of herbicides. Shutting down those farms near the river meant 15 years of effort wasted. An unexpected impact of losing so much farmland was a national "kimchi crisis" in the autumn after our visit, as a shortage of cabbage was blamed on lost farm production due to the Four Rivers Project. Kimchi, the spicy national dish, was served at every meal we ate in Korea. The cabbage shortage became a political issue, debated by the national legislature. "The government calls this 'green economy,' but has no concern about the ecology," Choony said. "They just keep construction workers busy, busy, busy." The project is being pushed along aggressively because South Korea's presidents are limited to one five-year term and so President Lee "wants everything done in his time," Choony said. The river widening and excavations do face opposition within the country. Polls find that the majority of the public opposes the work, both for its $20 billion cost and for its ecological impact. In a national election just before we visited, the president's ruling party had lost about half of its controlling majority in the legislature to opponents from other parties. Despite that change, the project was forging ahead, with a goal to finish by 2013. We asked Choony what KFEM hoped would happen to halt the work. "The president cares about voices from the international community. He took part in the G20 meeting in Toronto, Canada [in 2010]. Korea will be the host government next time. He has created the Global Green Growth Institute. They want to advocate this Four Rivers Restoration Project to the international community, saying it creates jobs and 'green economic growth.' We say, 'No, if you look at this case, it's not real.' We give out information, but other nations listen to the government. So we need to give information to the international community, because he may listen to that voice. The international voice can come back to the domestic voice." In the United States, a project of this type would require extensive environmental impact studies and would possibly be checked by lawsuits. In South Korea, KFEM lost a lawsuit against the project based on its impact to an endangered aster species (Aster altaicus) that depends on the riverbank environments. The court was persuaded by the government's promise to mitigate the impact by rescuing the asters from excavation areas and cultivating them in special plots. From a watershed that gathers runoff from mountains to the east and southeast, the great Han River passes through Seoul, then turns northwest until it enters the ocean at the Demilitarized Zone. We followed the river upstream from Seoul to Yeoju, a city on the south fork of the Han. Our driver, KFEM photographer Jong-Hak Park, had a medallion hung on the dashboard of his car showing that he supported the International Crane Foundation. Now 68 years old, he had worked with KFEM for 12 years. "I love KFEM, because my grandson has allergy," he told us. "I heard that it's from environmental pollution, so I will keep the environment." Two other young and energetic KFEM staffers, Yong-un Ma, the organization's wetlands expert, and Naree Jeong, coordinator of a Nature Conservation Team, showed us a six-mile stretch of the river where construction crews were building three dams and excavators were filling trucks with loads of riverbed sand and gravel, adding to mountains of material piled nearby. The scale of the work was shocking. We had never seen so many gigantic excavators at work, digging, widening, chewing up, and spitting out the former riverbed. The dams we saw under construction were close enough together so that a series of excavated "water basins," separated by gates and locks, could conceivably become a continuous canal to serve shipping. Opponents of the project think that is exactly the point, as a grand canal connecting the nation's rivers was one of President Lee's key campaign promises until negative public opinion stopped the plan. The Koreans working against the project were inspiring. It seemed hopeless, yet they were bearing witness to anyone who would listen, and asking us to "please tell the rest of the world what is happening to our rivers." KFEM was created when several South Korean groups involved in anti-pollution and anti-nuclear issues merged in 1987. The nongovernmental organization has fifty local chapters, whose 30,000 members pay monthly dues. We were treated grandly that evening with a feast held at a restaurant overlooking the river owned by Hang Jin Lee, the head of the Yeoju chapter of KFEM. He told us that he is "not a born environmentalist, but about 10 years ago my friends asked me to work for the environment. I began to realize that environmental protection is very, very important. And now I cannot leave this work." Having given considerable thought to two opposing characteristics of humanity, consciousness and greed, he hoped that "we can regain the essence of consciousness-the relationship with living things and nonliving things." From the window in our hotel room that night, we had a view of the Han River midway between the two work sites we had seen that day, where excavators continued to chew away at the riverbank. The United States went through a river damming, channel straightening, and concrete armoring stage in the past century. We learned that a more effective way to manage watershed systems is to allow floodplains to absorb high-water episodes and regulate flows while the riverbank vegetation filters impurities. So it was frustrating to watch the living river bottom being pulled out and lush riverside plateaus being excavated. Although the momentum of the work seemed impossible to stop, opponents of the project remained determined. On a poster in the Yeoju KFEM office, the endangered aster plant was depicted restraining an excavator. Mr. Ma told us the words on the poster read: "Be Persistent; It Is Your River." On the sixtieth anniversary of the start of the Korean War, June 25, 2010, we entered the Demilitarized Zone (DMZ) that separates North and South Korea. We were with a delegation from Pasadena, California, which has a "Friendship City" relationship with Paju, a booming South Korean city on the edge of the DMZ (37°46′N). Few travelers are allowed inside the Joint Security Area of the DMZ, administered by the United Nations, so this was a unique opportunity for our 38th parallel exploration. A strip of land 150 miles long and 2.5 miles wide, the DMZ crosses the Korean Peninsula at the 38th parallel. A peace treaty was never formalized to end the Korean War, and North and South Korea each keep hundreds of thousands of soldiers massed along their borders in a tense military standoff, with the DMZ functioning as a no-man's-land between the two nations. The war began in 1950, the year David was born, and the cease-fire came in 1953, Janet's birth year. During our entire lives, soldiers have stood watch over a land fringed with barbed wire and perhaps a million landmines; at the same time, the land has healed itself and an inadvertent ecological recovery has occurred. Most of that landscape was farmed for thousands of years, then ravaged when it became a battlefield. Ironically, after years of war and a peaceful standoff that has kept human activity out of the DMZ, eleven hundred types of plants now grow behind the barbed wire, and the land is green and lush. At the western edge of the DMZ, the Han and Imjin Rivers estuary provides rich tidelands and riparian habitat for wildlife, including eighteen endemic fish species (found only there) and the endangered Korean Golden Frog (Pelophylax chosenicus). The Han River estuary is the only one in South Korea that retains its natural function as a nursery for marine life in the Yellow Sea; others along the nation's coast have been degraded by wetlands reclamation or dams at river mouths. Many endangered or threatened bird and mammal species are thriving in the estuary and in other wetland basins inside the DMZ, including three species of cranes that arrive each winter. Asiatic Black Bears (Ursus thibetanus) are found, as well as leopards, lynx, and possibly the exceedingly rare Siberian Tiger (Panthera tigris altaica), if glimpses seen on military surveillance cameras and territorial scratch marks on trees have been correctly interpreted. Winter is the peak season for migratory birds; but the summer residents we saw included herons, egrets, and magpies; flocks of Bean Geese (Anser fabalis); and the colorful Black-Capped Kingfisher (Halcyon pileata). We had numerous fleeting looks at Water Deer (Hydropotes inermis), whose males have large tusks at their jaws, but no antlers. Seeing any wildlife was a treat, as we were allowed only to travel directly to Daesong-dong village, where 212 South Koreans live inside the DMZ (37°57′N). The Pasadena delegation was granted special permission to enter the Zone to dedicate a new dental clinic there on the war's 60th anniversary. The group included Yung Nam, a Korean-American dentist, who was the inspiring force behind the clinic. Until this time, we had no idea that any people actually lived inside the DMZ, but both South and North Korea are allowed small "unification" or "peace" villages. The rest of the Zone remains unoccupied, and that is where the ecological experiment in human exclusion has been under way. Our group passed through checkpoints where serious-looking soldiers closely examined our passports and paperwork before giving the driver a piece of cloth to hang from the window of our van-a low-tech signal that we had permission to be inside the Joint Security Area itself. Beyond the checkpoint, our initial impressions were of verdant forest and quiet. The energy and bustle of modern South Korea had been left behind. 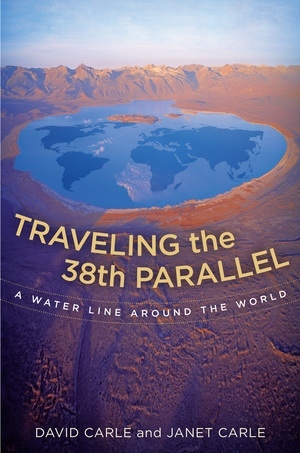 Between extremes of climate farther north and south, the 38th North parallel line marks a temperate, middle latitude where human societies have thrived since the beginning of civilization. It divides North and South Korea, passes through Athens and San Francisco, and bisects Mono Lake in the eastern Sierra Nevada, where authors David and Janet Carle make their home. Former park rangers, the authors set out on an around-the-world journey in search of water-related environmental and cultural intersections along the 38th parallel. This book is a chronicle of their adventures as they meet people confronting challenges in water supply, pollution, wetlands loss, and habitat protection. At the heart of the narrative are the riveting stories of the passionate individuals—scientists, educators, and local activists—who are struggling to preserve some of the world's most amazing, yet threatened, landscapes. Traveling largely outside of cities, away from well-beaten tourist tracks, the authors cross Japan, Korea, China, Turkmenistan, Turkey, Greece, Sicily, Spain, Portugal, the Azores Islands, and the United States—from Chesapeake Bay to San Francisco Bay. The stories they gather provide stark contrasts as well as reaffirming similarities across diverse cultures. Generously illustrated with maps and photos, Traveling the 38th Parallel documents devastating environmental losses but also inspiring gains made through the efforts of dedicated individuals working against the odds to protect these fragile places. David and Janet Carle were state park rangers at Mono Lake Tufa State Reserve for twenty years and have taught at Cerro Coso Community College in Mammoth Lakes. Janet is the editor of the California State Park Rangers Association journal, The Wave. David is the author of numerous books including Introduction to Earth, Soil and Land in California, Introduction to Water in California, Introduction to Fire in California, and Introduction to Air in California (all by UC Press).